More info:Prices based on 2 adults sharing. Single supplement available. Mimimum age 14. Small group travel is not large group travel scaled down. It is modelled on independent travel – but with the advantage of a group leader to take care of the itinerary, accommodation and tickets, and dealing with the language. It’s easy to tick off the big sights independently – but finding those one-off experiences, local festivals, traveling markets and secret viewpoints is almost impossible for someone without the insider knowledge gained from years in the field. If you’re heading off on a gap year your, perhaps – but for those with a two-week vacation, a small group tour will save valuable planning time. The leaders are not guides – they’re not there to shepherd you around. Instead, they’ll let you know which local restaurant serves great value food – without running the risk of travelers’ tummy. They’ll allow you to avoid hour-long queues at train stations and attractions. We like to think of small group travel as the Goldilocks option. It is independent travel without the fuss, worry and bunk beds – and organised travel without the coaches. And it’s cheaper than a tailor made tour. It’s sits somewhere in the middle – and we think it’s just about right. Have big, life-enriching experiences that would be impossible to organise without lots of time and insider knowledge. Make the most of your vacation time by letting someone else do the hard work and boring logistics! Small group tours take care of the security aspects – and provide a safety net should anything unexpected happen. Who is it ideal for? If you don’t have three months to spend exploring, small groups trips let you cover more ground in less time. Your days are not spent queuing for tickets or finding hotels – so you can squeeze more into your vacation. Likeminded travel companions plus peace of mind for those traveling alone. Single supplements are usually available – providing privacy if you want it. Stray from the tourist trail without worrying about getting lost, and meet local people without dealing with the language barrier. Couples and friends have private rooms, and you can choose to eat alone or not. Single supplements give solo travelers their own room. Free mornings or afternoons let you explore on your own, or just relax. Trips are as high or low end as you like. Though off the beaten track destinations won’t have luxury hotels, this is all part of the adventure. Tour operators try to create groups with a similar demographic – age, families, activity levels... Chances are, you’ll even make new friends. No matter how experienced your group leader, they can never make up for the knowledge gained from a lifetime in the destination. That’s why many of our trips work with local guides around the world – who invite you into their homeland with pleasure. We consciously strive to reduce wastage and minimise the environmental impact of our small group trips by asking customers and staff to travel with a reusable water bottle, to reuse towels and sheets and turn off lights and water when not in use. Plastic waste in India is already a huge problem, we aim to minimise adding to this by refilling water bottles and using material shopping bags rather than plastic. As well as being low impact, cycling is a great way to get closer to the local way of life as you can easily stop and visit offbeat places, chat to the locals… so it’s friendly and environmentally friendly! Pedal power is one of the most sustainable and lowest impact forms of transport so it’s a great way to keep your carbon footprint (and waist measurement!) low. By using Homestays we also reduce our environmental impact as waste and energy usage will be much lower than in larger hotels. 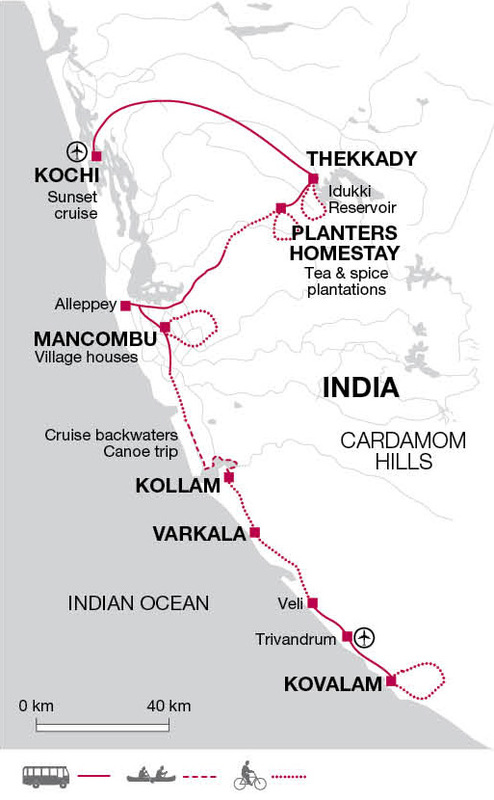 In Kerala we stay at locally owned and run hotels and homestays, and recommend local restaurants, meaning a more authentic experience for the traveler and direct economic benefit for the communities visited. As on any cycling trip there are many stops for refreshments, these are all at local cafes and small entrepreneurial stands along the route allowing us to support local communities as we pass through. We also stop at vibrant markets where you can purchase traditional gifts and crafts. Where the tour ends in Kochi you may wish to try a traditional Ayurvedic massage. Cycling has a unique way of enabling interaction with locals which in turn can give you an insight and understanding of their culture and lifestyle. We visit Periyar National Park who employ and train their guides from the local area. This community based eco-tourism project is the hallmark of the Tiger Reserve. People who once made a living by illegal operations in the forest are now paid to take an active part in its protection. Our visit helps fund this project and our contribution directly helps forest conservation and community welfare. In addition to the above, we are continually looking for ways to improve and are proud to be ‘Responsible in everything we do’. Education is key and so all staff, Tour leaders and partnering suppliers are trained in responsible and sustainable tourism. At our Head Office, we continually strive towards a sustainable and planet-friendly working environment, including having solar panels installed and a company commitment to reducing our plastic usage. As well as this, we have valuable and longstanding partnerships with UK charities Toilet Twinning and Send a Cow, plus many smaller initiatives and projects around the world. We’re members of UK travel industry bodies Tourism Concern and AITO because we believe it’s important to share our knowledge and experience, as well as learn from other operators. We acknowledge that air travel has a negative impact on our environment, so we work together with Cool Earth to offset carbon and protect our important rainforests.